Murray Hill Heights neighborhood finally gets new playground - The Resident Community News Group, Inc. | The Resident Community News Group, Inc.
A new playground in one quadrant of Four Corners Park in Murray Hill draws neighbors together. 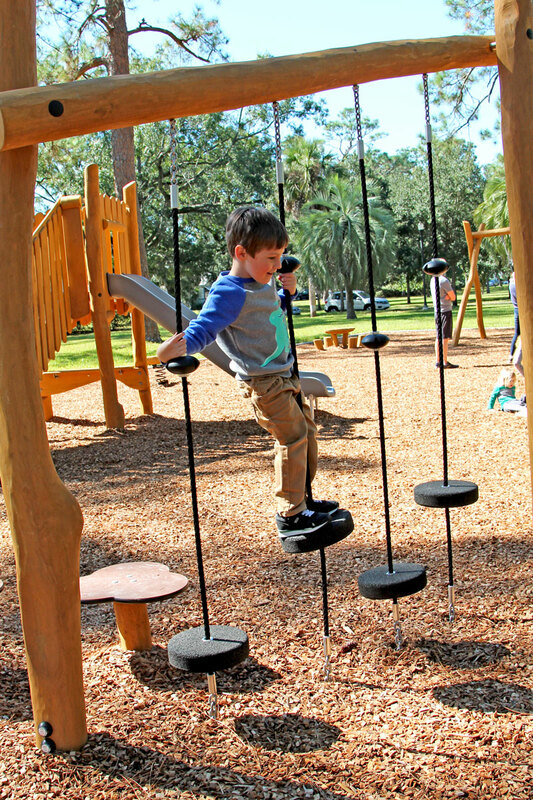 Sawyer Collins show off his balance skills at the new playground in Four Corners Park in Murray Hill. Sarah, Sean and Sawyer Collins live just a couple of blocks from Four Corners Park in Murray Hill. 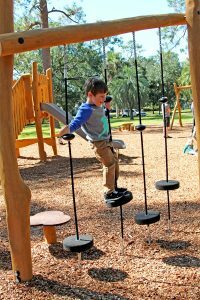 On Nov. 3, they took a stroll up to the Murray Hill Library to participate in early voting, then wandered down to the park to spend time at the new playground, which opened Oct. 24. The playground was, indeed, a long time coming. Two and a half years ago, in May 2016, residents met with Keith Meyerl, a division chief with Parks, Recreation and Community Services, at which time they indicated a preference for a small playground in a design that would fit in with the heavily wooded nature of the 7.38-acre Four Corners Park, which has four quadrants created by the intersection of Lawnview Street and Lamboll Avenue. A year later, after getting pushback by a few residents who were afraid the playground would bring in crowds from other neighborhoods – as has happened with the much larger playground in Boone Park on St. Johns Avenue, or would create parking issues or attract undesirable activity in the park, the City’s Parks and Recreation Department decided to postpone ordering the equipment until representatives could talk to those opposed. In the meantime, residents started an online petition for the park and received 160 signatures in support. There were hopes the new playground would be installed by December 2017, but the City did not place the order for the Kompan equipment until this past summer. The estimated cost of the playground was $65,000, which was funded by City Council District 14 bond funds. The material selected by Stacy Moseley, the Kompan representative who has worked with several community groups and schools in playground renovations, is Robinia, a hardwood with a 15-year warranty that blends with the wooded landscape of the park. Additionally, a slide saved from the Boone Park playground renovation was relocated to the Four Corners playground. The playground was finished in late October, in time for families to meet prior to heading out for Halloween trick or treat.